This version of GitHub Enterprise was discontinued on June 5, 2018. No patch releases will be made, even for critical security issues. For better performance, improved security, and new features, upgrade to the latest version of GitHub Enterprise. For help with the upgrade, contact GitHub Enterprise support. You can manage your starred repositories to find what you're looking for. Your stars page (https://[hostname]/stars) provides a multitude of actions you can take to sort, manage, and list your stars. Note: You can access your stars page from your profile page. You can use the search bar to quickly find repositories you've starred. The search bar only searches based on the name of a repository, and not on any other qualifiers (such as the size of the repository or when it was last updated). This orders by your most recently starred repositories. This orders by your starred repositories by when they were last updated. This orders the repositories you follow with the most overall stars. 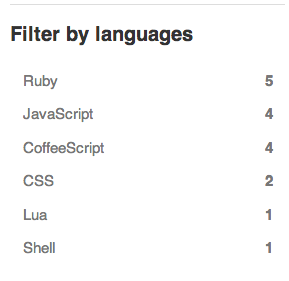 On the right side of the page, you can filter your list of starred repositories based on their language. In the lower-right corner of the page, you can also browse your friends' starred repositories. You can use this to check out what your peers are following and find some cool new repositories to star.